Love to play puzzles ? Enjoy a new unique match 3 games ? A unique 3 match puzzle game is for you! Magic Match A 3 Match Puzzle is awesome matching games and amazing power ups and the same addictive game mechanics await for you in this match 3 puzzle game. 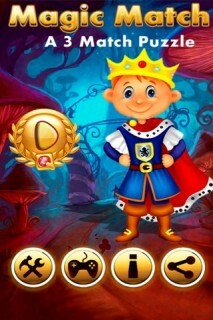 where you can solve hundreds of puzzles to defeat the evil to become the king of the beautiful magic land ! 1. Addictive family friendly gameplay. 2. Enjoy amazing graphics and sound. 3. Complete different targets to win the level before you run out of moves. 4. Unlock new beautiful land and exciting new gameplay.